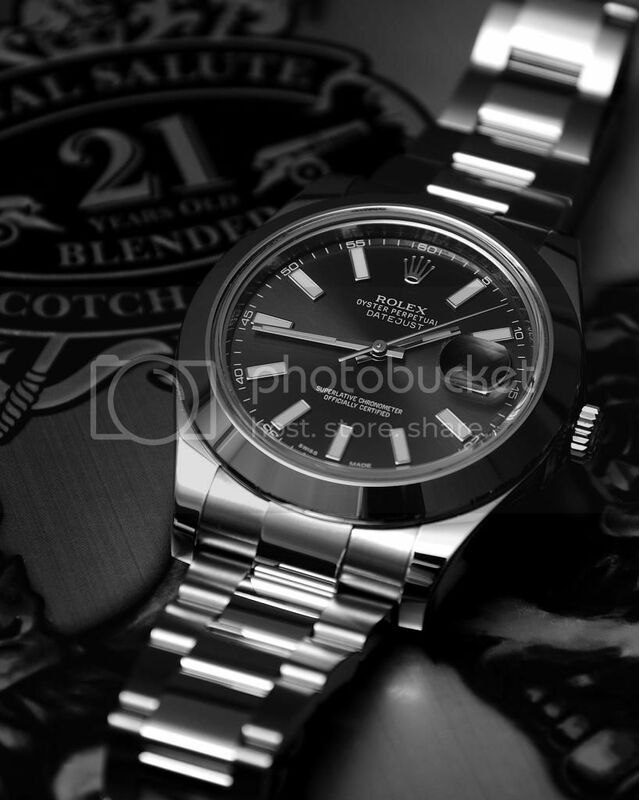 Great choice - I've had several, but sold them all as I just couldnt get used to the spinny-crown function select - it is terrible, terrible, terrible... Apart from that, it's one of my favourite watches of all time! 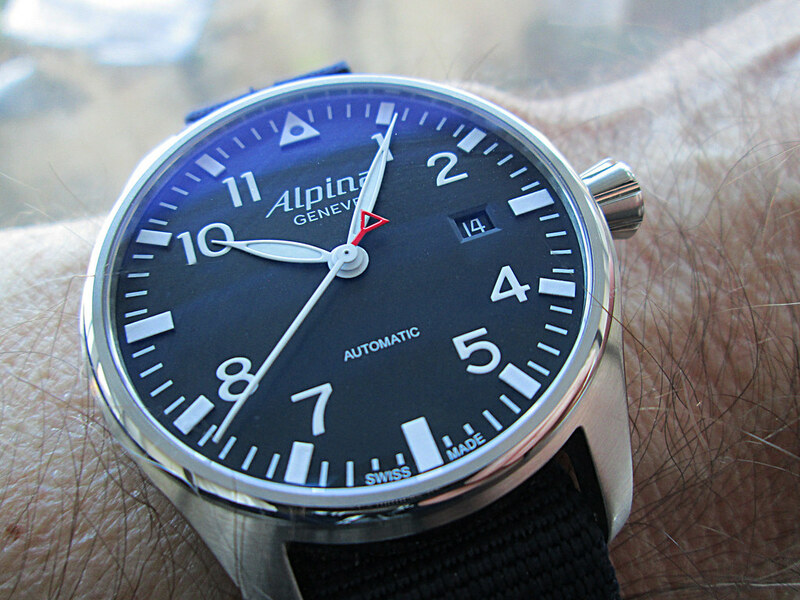 I often looked at Aerospaces, but could never convince myself I wanted to spend that much on quartz watch. I could never really get on with the fixed 'bezel' look on the Aerospace, especially the 'fittings' (or other Breitlings with similar features), which (along with a logical operation with two extra buttons) the B-1 solves. The picture of yours (now a couple of posts back!) looks much better in that respect to me. Is it just the photo or have they changed the look? That said, I can see the appeal of the slimmer case and Titanium for many. 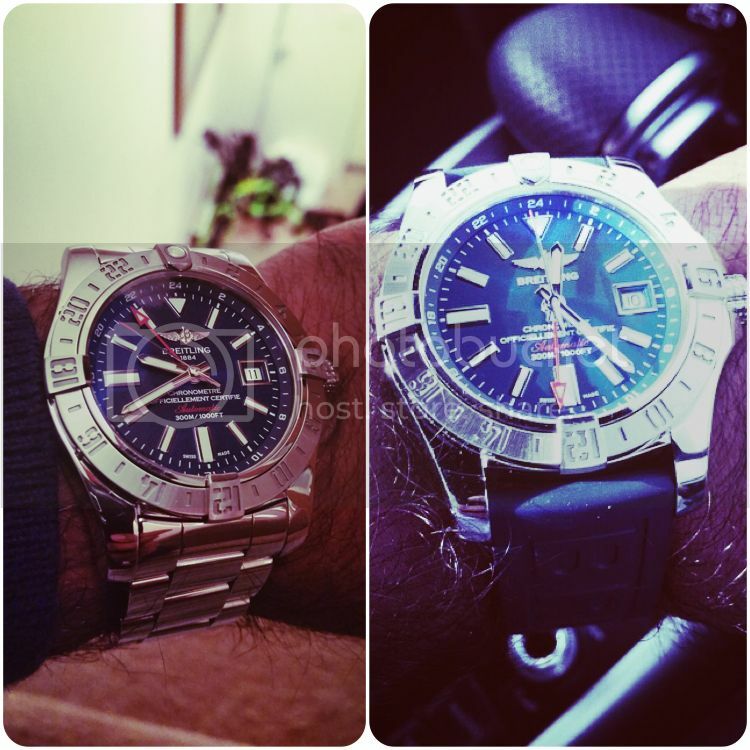 Last edited by snowman; 5th January 2015 at 17:05.
this might be the last watch i buy for a long time and actually, i think it is a pretty decent way to wrap things up. I am something of a sucker for colourful watches and couldn't resist this when I saw it recently. It was advertised as a 2231.80.00 model and research here and elsewhere suggests that the original electric blue has aged to this purple. 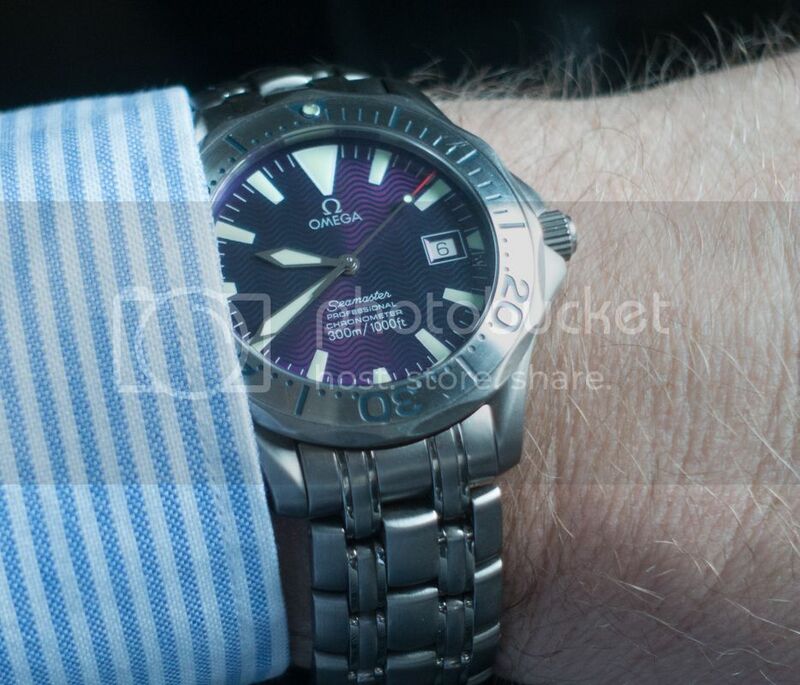 It's so uniform though that I wonder if the comments I have seen suggesting that Omega did make a limited number of these with purple dials are correct. Does anyone have any more knowledge? It's difficult to photograph - this is the best I have managed so far. Well, it arrived a couple of days ago... quick iPhone shot, whilst I motivate myself to get the gear out and do it properly! Has the twiddly crown driven you mad yet?! Some new (vintage) arrivals come with issues... 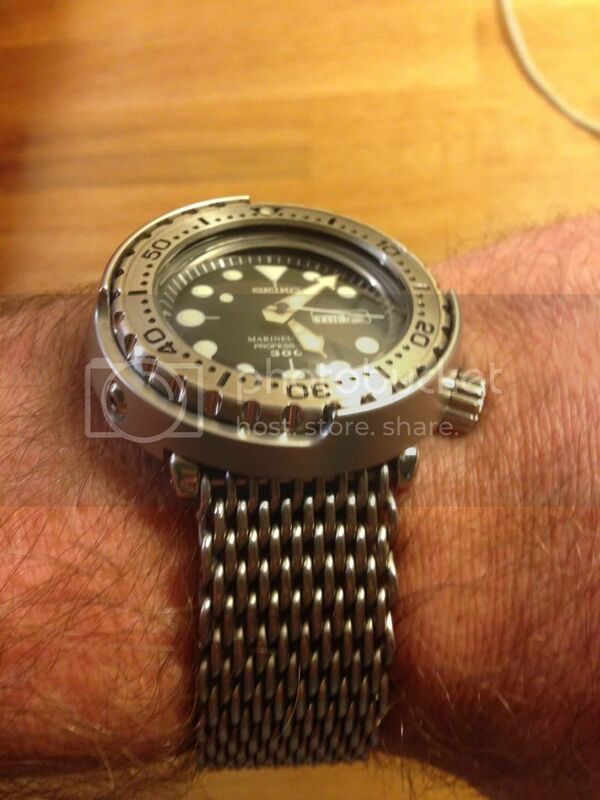 This one is off to my watch repair guy. AS1701 mainspring barrel (complete) anyone? I posted this in the Friday thread… but though I'd pot here too. 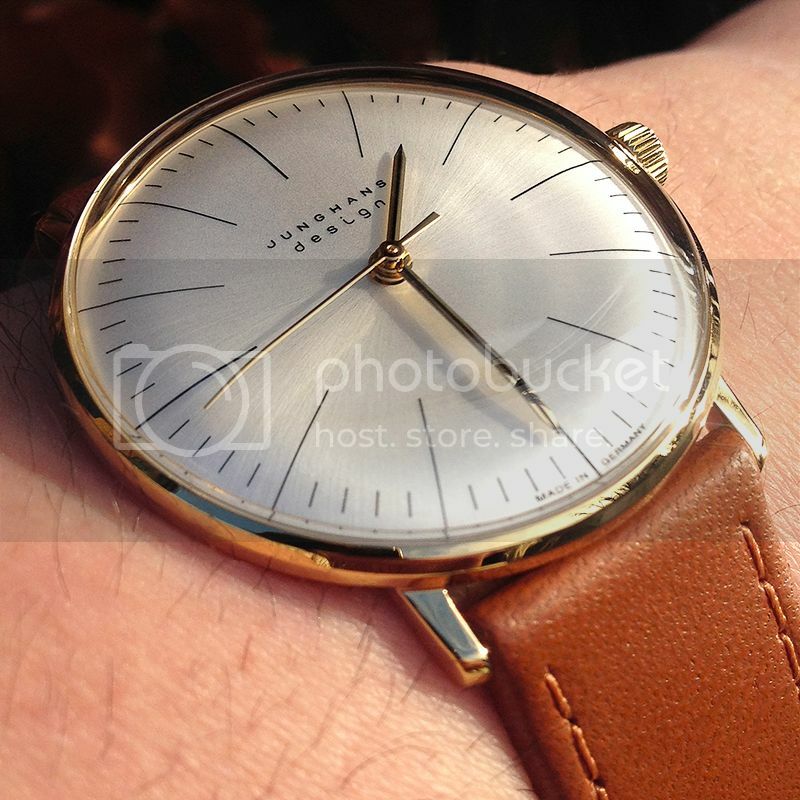 The first full week with my Junghans Max Bill ref: 027/5703:00. 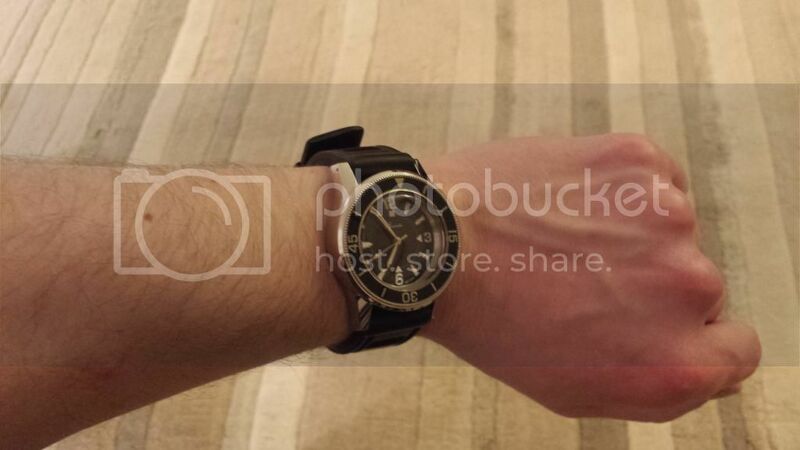 Its a magnificent little thing… 34mm, which is making me feel even more love for a smaller slimmer watch. 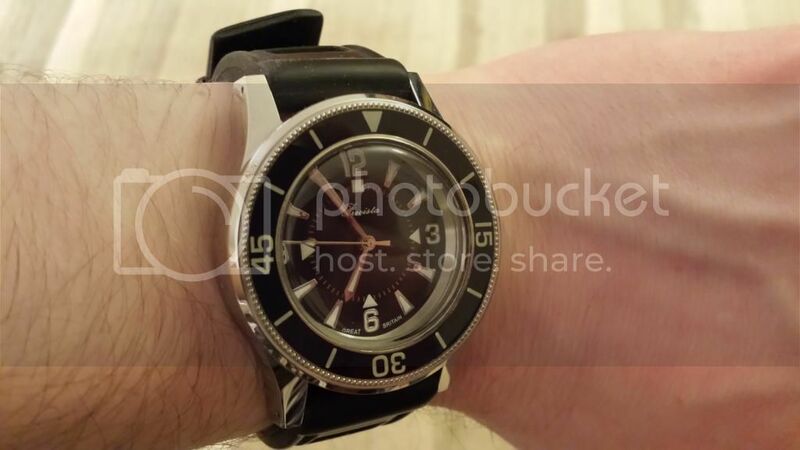 As always though, appears larger with a lack of bezel and lighter coloured dial. Apparently it is 9mm thick, but that must all be in the plexi as it doesn't look it in any way. The dial plays beautifully with the light as it is a matt silver plate, meaning its constantly changing with wrist movement. Also the dial is printed so crisply and right to the very edge. Very subtle, that the 12/3/6/9 hash-marks are slightly thicker, probably .5mm compared to the rest which are .3mm. Makes more a difference than you'd imagine and helps balance things out. The hour/minute hands are also gold-plated, but have a thin black in-lay which you might not be able to make out it the picture… it really helps seeing the hands in any light and adds another layer of texture to the overall package. Again the black is filled the entire length to the very tip. Sorry just read this thread so I will add my first incoming for 2015 that I collected from Neal on Saturday! Picked this up last week whilst in Cape Town. Always wanted one and thanks to a favourable exchange rate and some haggling I couldn't resist! Thought this wasn't bad value for an Automatic, and arrived in December. Bit heavy with the SS bracelet so its on a rubber deployment at the moment till a decent leather can be sourced (23mm). 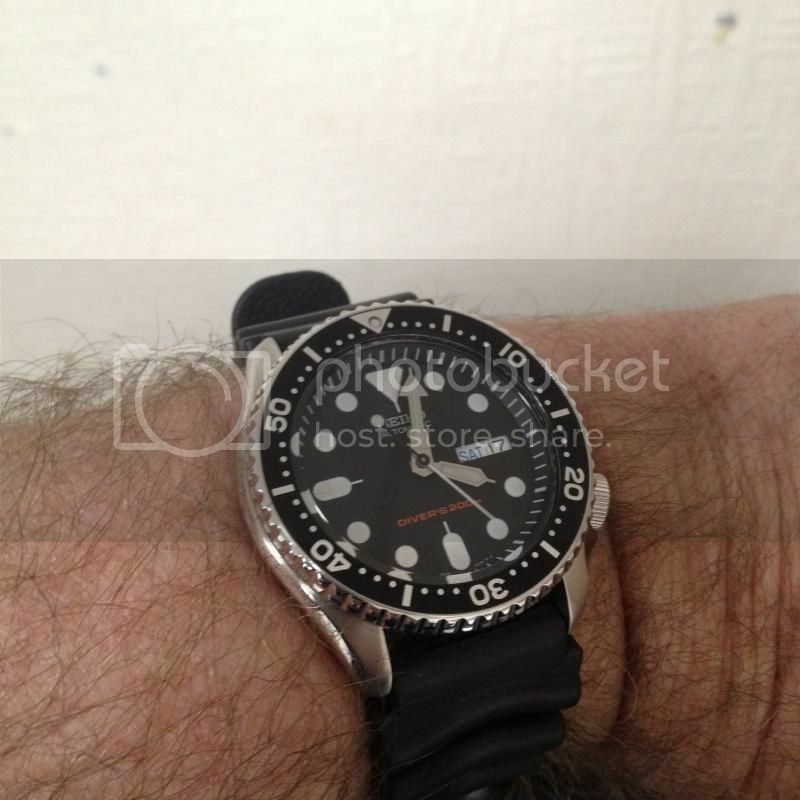 Previous advice on this forum, which seems to work trying other straps I have, suggests a 24mm strap would fit fine if indeed not better!. Well I finally satisfied my curiousity and killed 2 birds with one stone and got an orange casio aviator. Am still in love with it. Pic taken from the sales thread. However, its much nicer in the flesh than the pictures which surprised me and surprisingly clear. 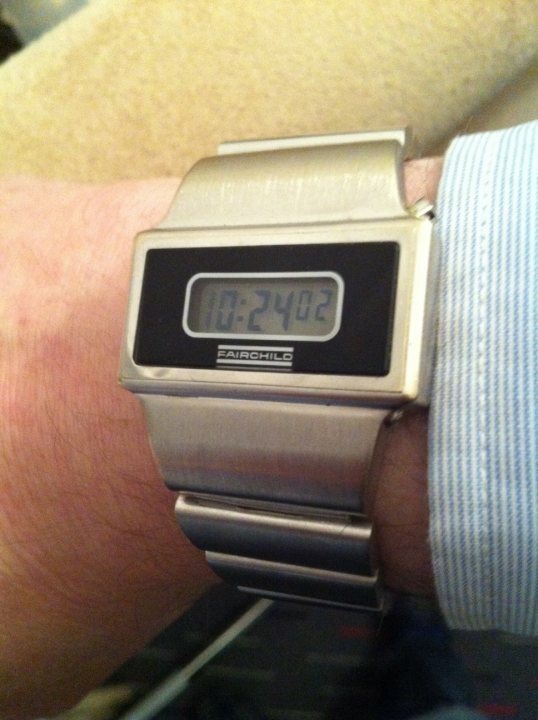 However, I just use it to tell the time and I really want to figure out the chrono function on it. Very nice, i'm torn between one of these, a pepsi or BLNR next.. This Max Bill arrived yesterday. Classic yet strangely contemporary. Enjoy. Last edited by Cornersruns; 15th January 2015 at 19:36. 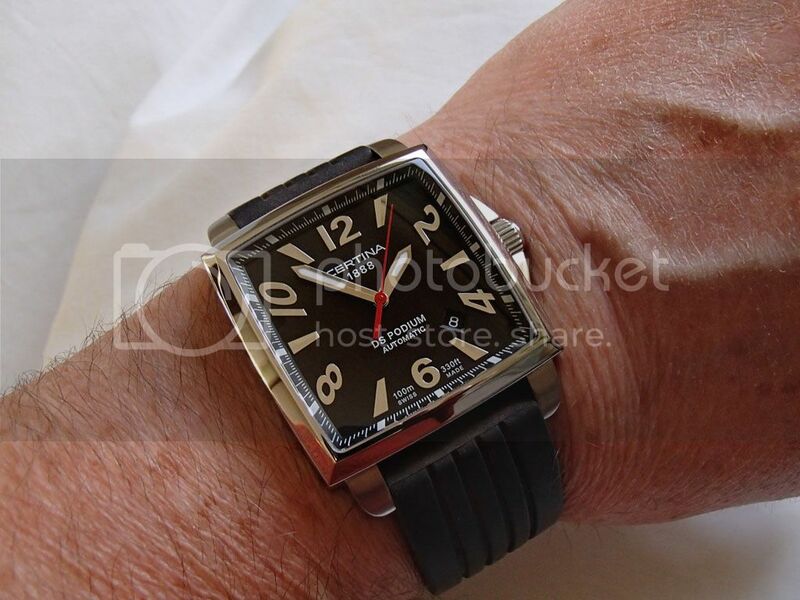 My Tudor 79180 'Big Block' finally arrived today. It is easily as mint as it appeared in the photos and is near NOS. As best I can tell it has never been refinsihed and retains all factory bevels, lug brushing etc. Very happy to have a 79180 back in my collection. Very happy to receive my Seiko FFF Black mod from Captain Morgan. 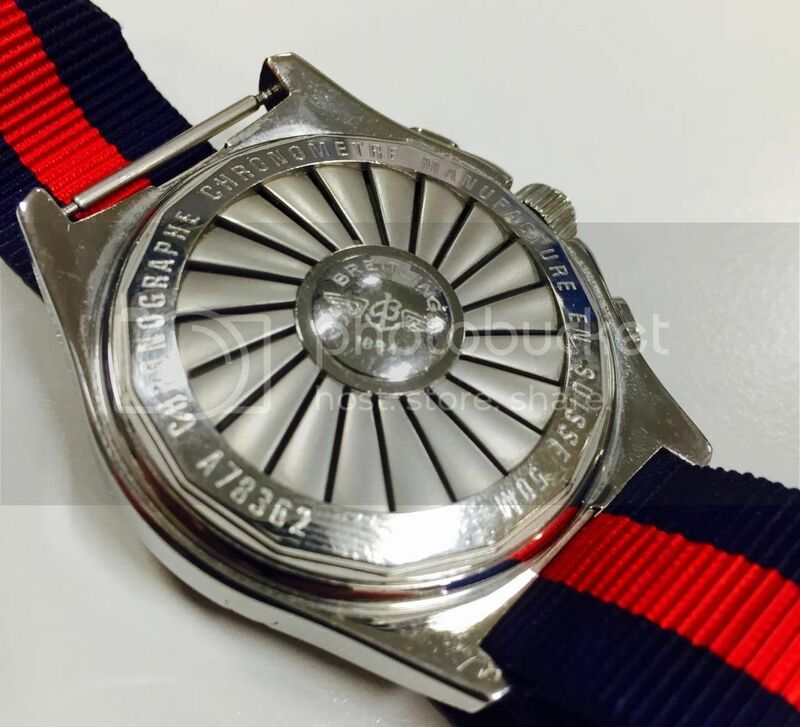 It is the actual watch I sold last year due to some erratic man logic. I had bought too many watches and forced myself to sell three. By now I have bought all again but this FFF mod was kind of special to me as I imported it myself, bought the dial, had it installed by Rob at monster watches. So there was some history and if I had to have one again it had to be "my old one". Contacted the person I sold to, who had sold it on and after a few pm's negotiated a deal with Simon. Truly love the forum spirit here and the wilingness of members to help, quite often in other places it is rare to get any response at all. Anyway here it is, back on the wrist. Couldnt be hapier! Last edited by Glen Goyne; 17th January 2015 at 16:52. Contacted the person I sold to ... Truly love the forum spirit here and the wilingness of members to help, quite often in other places it is rare to get any response at all. 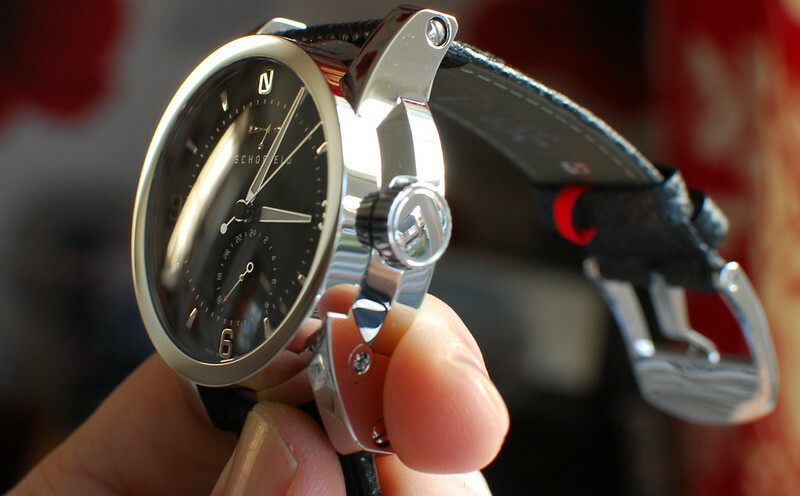 Happy to help reunite you with this fab watch! 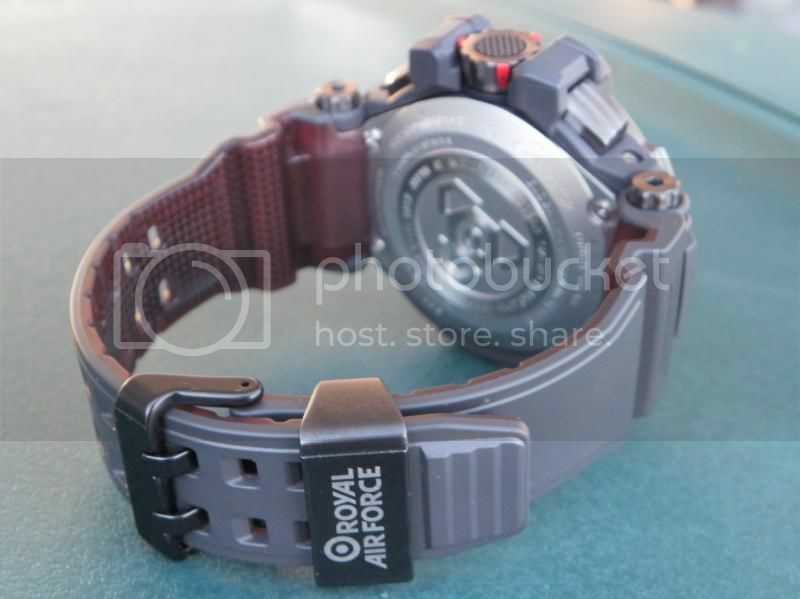 My first G-Shock, it was expensive for a g-shock but I really wanted the RAF limited edition. This watch is huge after wearing this for a day everything else seems small by comparison, luckily it's very light on the wrist. Fairchild Vintage LCD. I'm going to experiment replacing the original twin flat tritium tubes with 12 smaller cylindrical tubes. These 2 in the past fortnight.. So, this arrived on Friday. Last edited by Topcat30093; 28th January 2015 at 21:33. 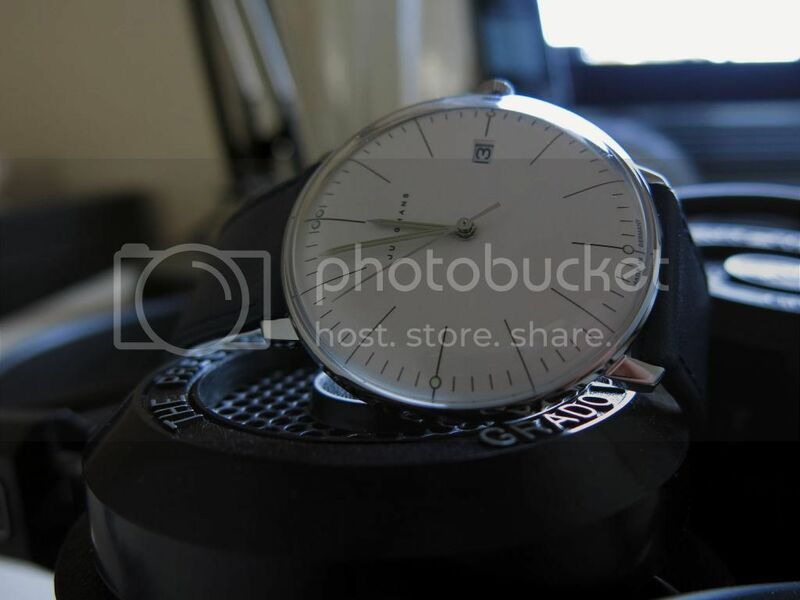 Last edited by pinpull; 19th January 2015 at 13:31. Quick first post to say hello. I've just registered althogh I've been a lurker on here for a while. lots of great reference posts here. Over the years I'd amassed too many watches. Nice Swiss automatics. Lots that didnt get any wrist time. So the plan over the last six months has been fewer better watches. 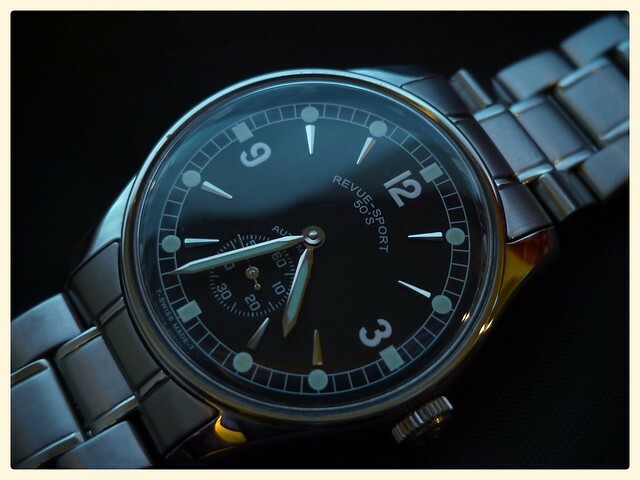 The Tag was my first decent watch. 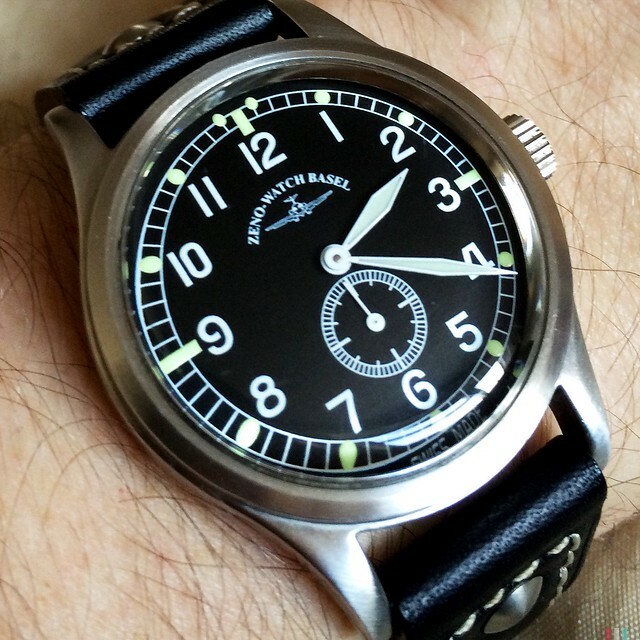 It still gets worn lots and has to stay, the Zenith is just lovely too. 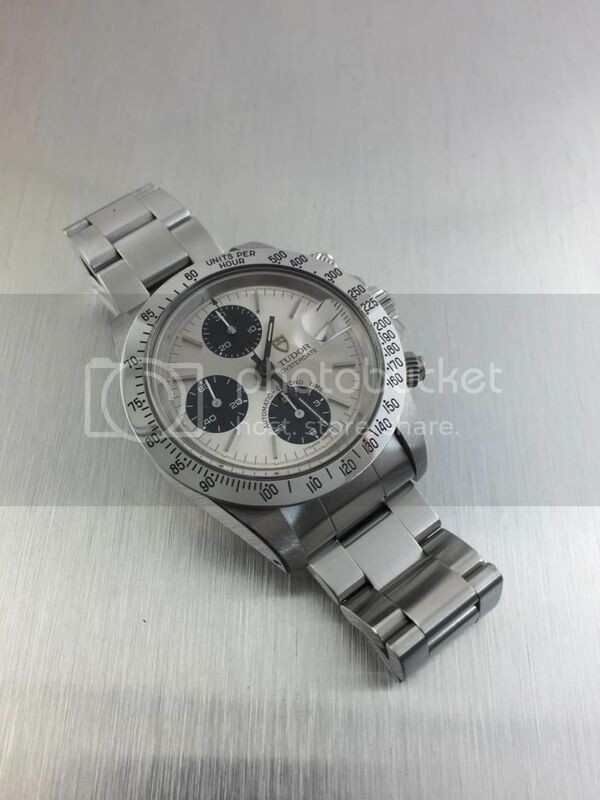 The others have been traded/sold/auctioned/part ex'd and as a result a ~9 year old Rolex 14060m "2 line" Sub is on it's way out of the proceeds. It's been a dream watch for a while. 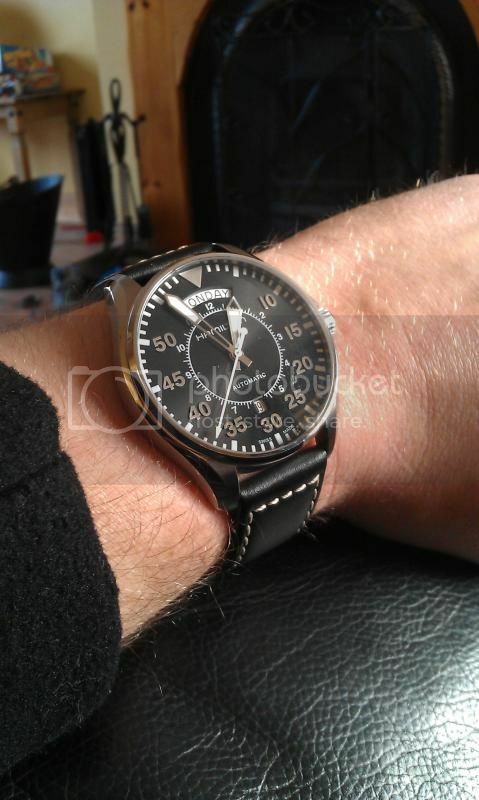 Hamilton Kahki Pilot automatic. I saw it in Beaverbrooks window yesterday afternoon as a pre-owned and on sale too. 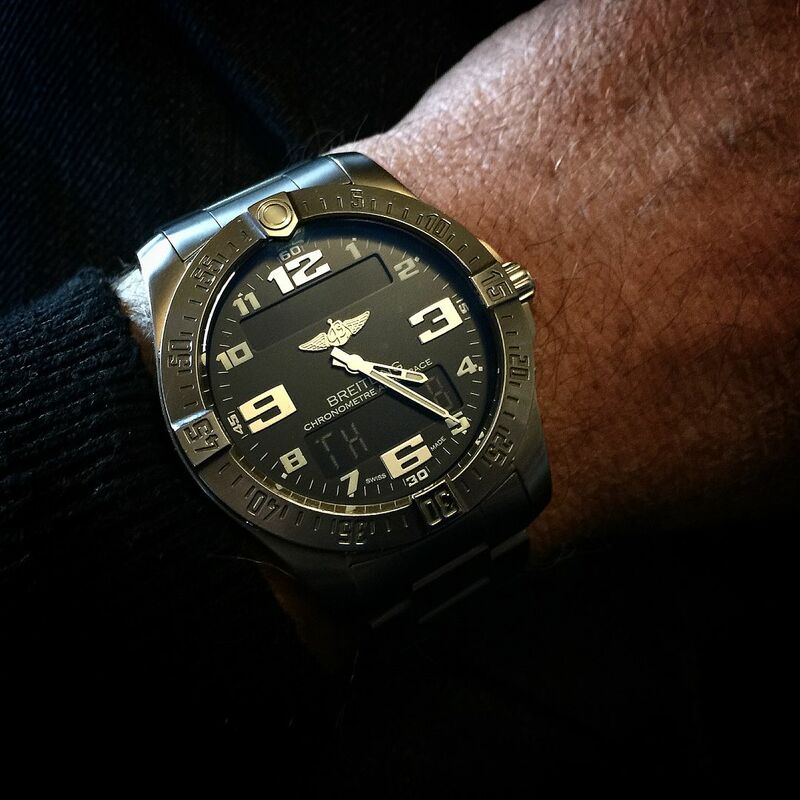 I wanted a military\pilot watch for my collection but most pilots are too big for me. 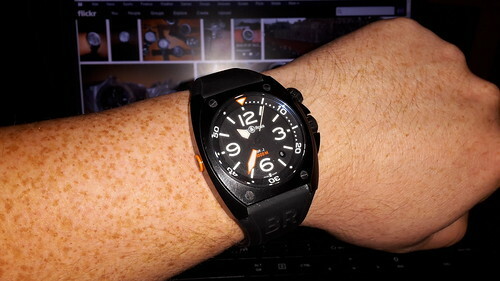 This at 42mm is right on my limit but feels good on the wrist. Kind of am impulse buy, well I did go and have a coffee while I thought about it, so I'm getting better! I took delivery of this on Friday following a trade with a fellow forum member. This particular model comes on a dark brown leather strap which really sets off the rose gold markers. I also like to wear my watches on a bracelet however and managed to pick one up to fit it from ebay and will be swapping between the two regularly. 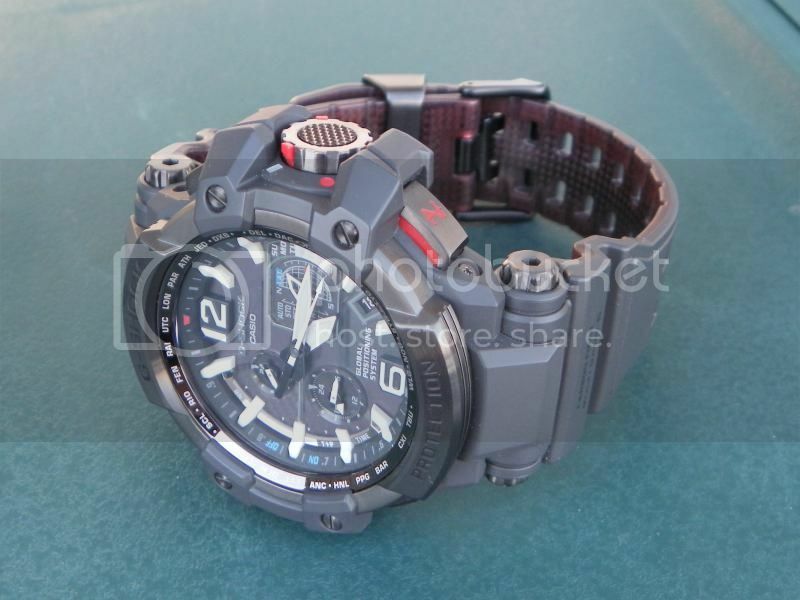 This will be my new daily office wear watch and I absolutely love it! I don't normally go for rose gold but am so glad I did this time. Edit - I probably should have given it a bit of wipe having seen the picture. Finger print city! Just got a watch for my three-year-old. She has been really interested in my watches lately, so when I saw this, I had to get it. 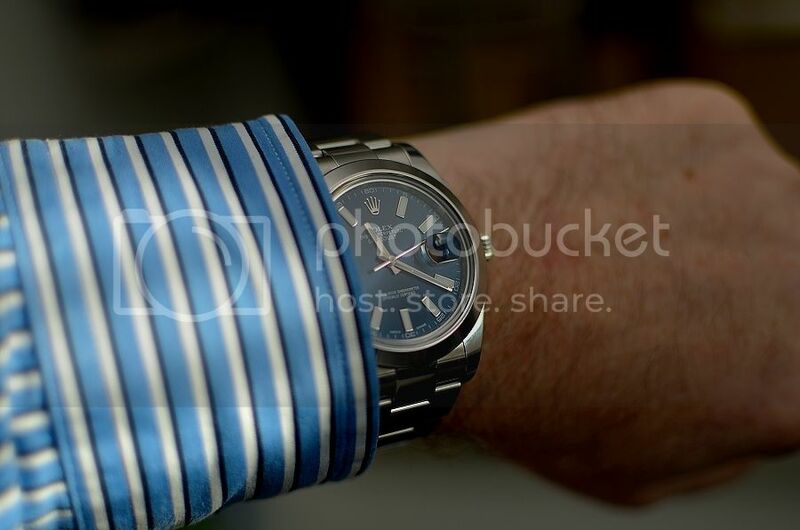 It was the first watch I've seen that suits a 3-y.o. girl. I maintain that this is not a fake. Nowhere does it read Hello Kitty and there are the subtle differences in the image that make this a homage. I had to make a compromise, as I dislike all fakes including this kind of stuff, but the compromise was worth a little chink in my armor. 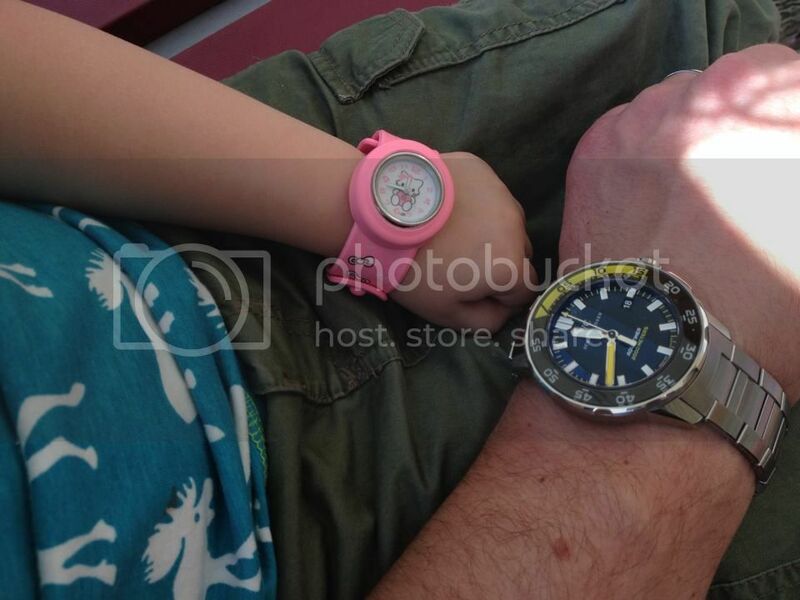 The look on her face, when she realized that she has a watch just like daddy's, was indeed priceless. Cute! 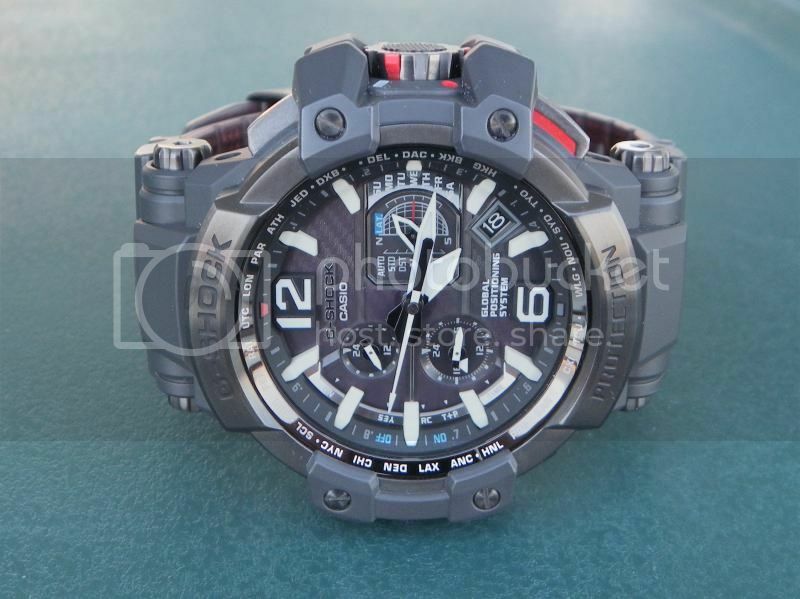 My 3 year olds keep trying to nick my watches - seem most interested in the G10 but my boy also the speedy - need to get something like this sharpish! Covers the main 3 year old female criteria - its pink! It's landed! 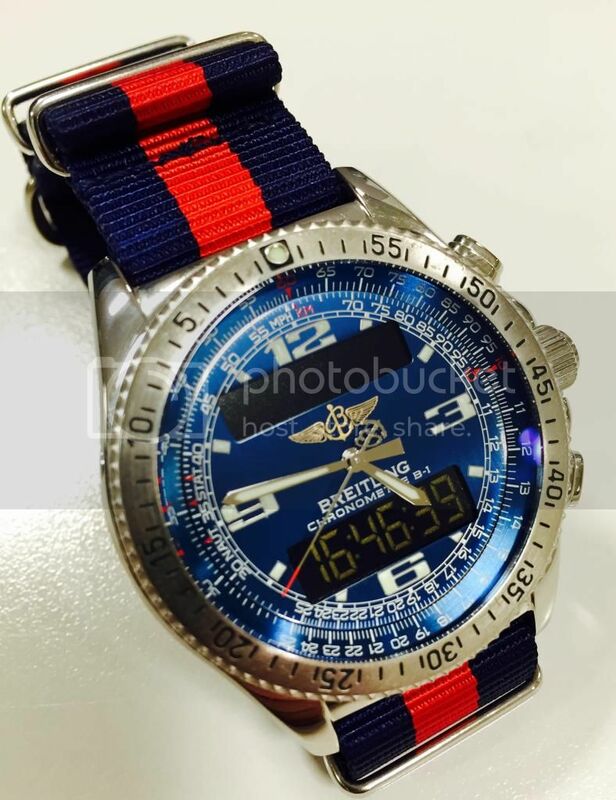 After a fairly long search I found a SuperQuartz B-1 in Blue - my ideal combination - on eBay. I reached a deal with the seller (a dealer called Darren Reay and on the basis of this experience, highly recommended he is, too) and here it is! Immediate impressions are that its a lot shinier than my old aerospace, but not so much as to be unpalatable. 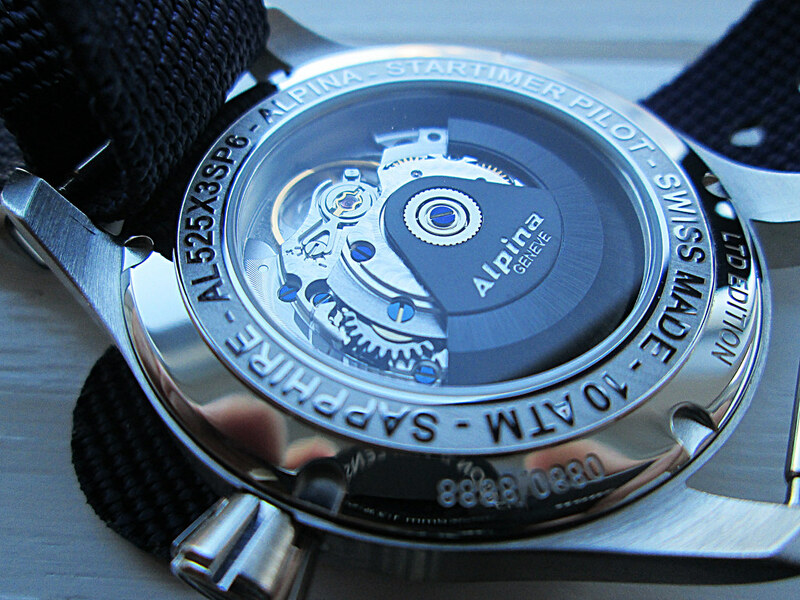 I love the iridescent brushed dial, the slide-rule and the beautiful turbine case back. The bracelet is a bit short but Darren's kindly agreed to find and send me an extra link - so I've bunged it on a NATO for now which actually works better than I'd thought it would. Sometimes you think to yourself, "With all the hassles, and the nagging, etc ... is married life *really* worth it?" (sorry I couldn't add the photo inline ... I don't actually have an online photo. account). This more than makes up for the Sumo that I got for Christmas, and then had to send back because the lume dots were misplaced.